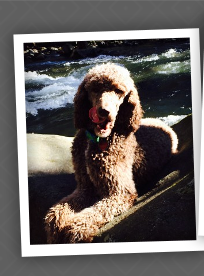 "Tucker" is a AKC/CKC Dual Registered Standard Poodle. He has had his PINN HIPS/ELBOWS completed. He has also been health tested via VetNostic Labs and is clear. He is large boned, thick and 75 lbs. He is 27 inches with champion bloodlines. 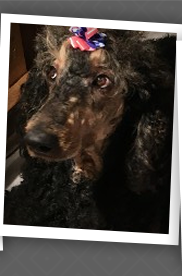 Tucker has an impressive pedigree with many colors. He is very calm, loving, intelligent, playful and occassionally "goofey". 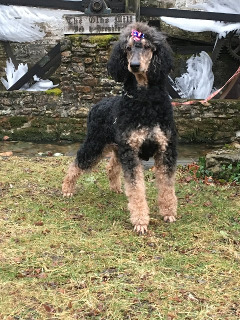 "Walter" is a AKC/CKC Dual Registered Tri Colored Standard Poodle. He has had his OFA HIPS/ELBOWS completed. He has also been health tested via VetNostic Labs and is clear. He is a big boy around 60lbs and 26 inches at the withers. Walter has an enormous pedigree of color and he is just stunning. He is a true couch potatoe, loving, playful, intelligent and also occassionally "goofey" also. "Tobby" is our newest addition to boys!!! He is the cutiest little thing. 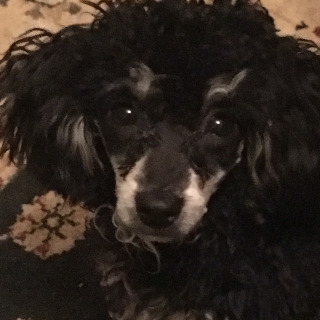 He is a CKC Toy Poodle. He is a brown merle with two blue eyes. Toby has it all!!! He carries for blue eyes, phantom, party and a multitude of colors. 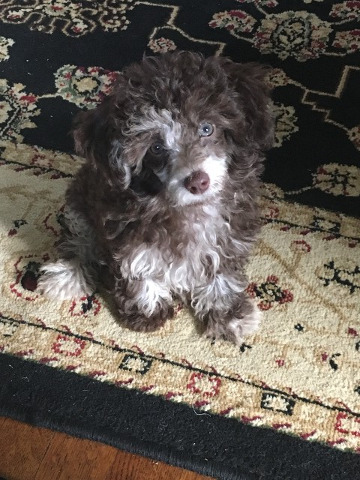 He should be around 4 to 6 lbs. Tobby is a true baby!!! He is sooo spoiled because he demands to be held, loved, cuddled and the center of attention! 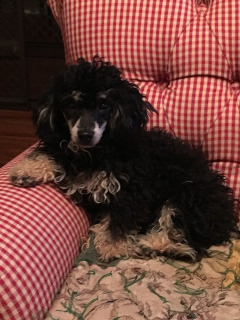 "Bash" is our AKC/CKC dual registered Black & Tan Toy Poodle. He has such a huge attitude for such a little guy. I think he is a cat in a little dogs body. He always has to be on the highest point he can get on and likes to sleep in boxes if he can find one. He has been health tested via Vetnostic Labs and is clear. He carries for the party gene and the tri colored gene as well!!! 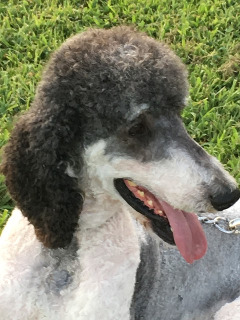 Phantasia is our beautiful AKC Phantom Standard Poodle. She is the smallest of our girls and is around 50 lbs. She is fully health tested via parentage!!! She has an amazing pedigree with champion bloodlines. Phantasia has the sweetest personality. She is very calm, loving, loyal and extremely intelligent!!! New pics coming soon of this beautiful girl! 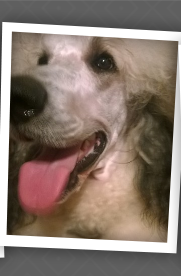 Darla is our AKC/CKC Phantom Standard Poodle that is the largest of our girls. She is 56 lbs and around 25 in at the withers. 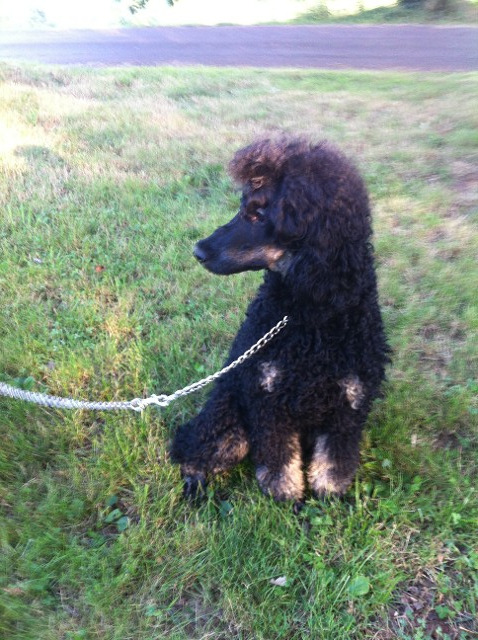 Darla is stunning and is a black and red phantom standard poodle which is very rare. 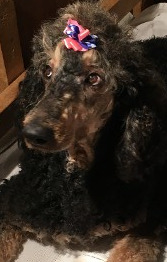 Unlike most Standard Poodles of phantom color she has held her color. 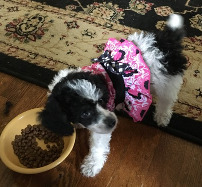 Darla has had her health testing completed by Vetnostic Labs and is clear. She is extremely affectionate, calm and very intelligent, as all of my dogs are!!! 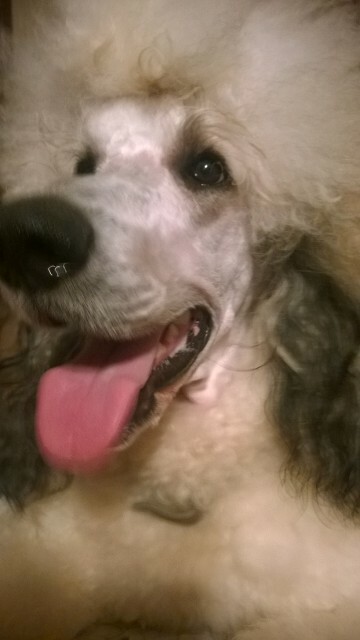 Lilly is our AKC/CKC Phantom Standard Poodle that is also on the smaller side. She is around 48 lbs and is a beautiful brown and tan phantom. She has also had her health testing completed by Vetnostic Labs. 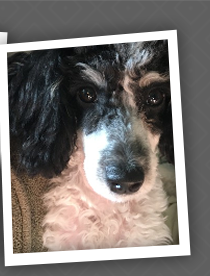 Lilly is very loving, laid back, calm, intelligent and just as sweet as they come!!! 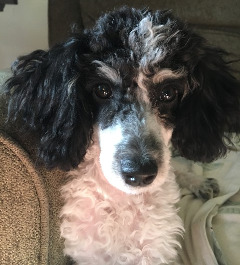 Chloe is our only female toy poodle. 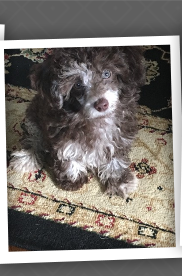 She is a small CKC Minature Tri Colored Poodle that also carries for the Merle gene. She will end up being around 10 lbs and around 10" to 13" tall. She is so sweet, loving, playful and as funny as she can be!!! She can out run all the other little ones, jump like the wind and almost takes flight at times!! !